Often, DashThis users interested in using CSV files can get confused by the two CSV features in the tool, the simplified and the advanced features. Simplified Widget: a very simple widget, created only to display a CSV file in a table-like format. Read this article to know how to create them. 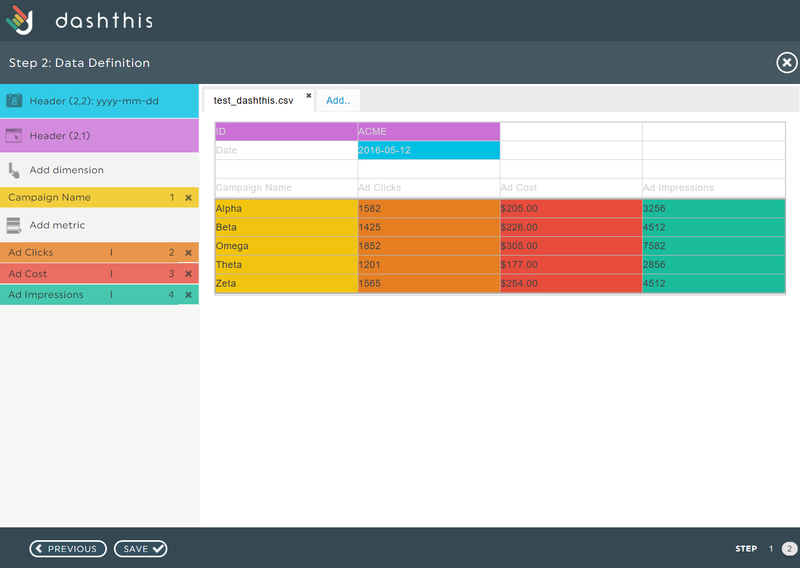 Advanced CSV Features: a complete solution where you can use a CSV file data to populate regular DashThis widgets. In the template creation process, you define the metrics and dimensions related to this custom data source (the CSV file). DashThis will then be able to extract these metrics and dimensions, and display them in various widgets, exactly like other data sources. This entry was posted in CSV files and tagged csv, custom. How to add a CSV File to a dashboard?